The NanoRacks Plate Reader, shown here, will enable in orbit analysis of research samples for certain studies aboard the International Space Station. The International Space Station is now home to more than 1,200 pounds (544 kilograms) of supplies delivered by an unmanned, privately built space capsule that reached the orbiting science laboratory on Sunday (March 3). Among the goods SpaceX's Dragon capsule transported to the station were science experiments primed and ready for the six international residents of the space station. "Dragon is scheduled to return to Earth on March 25, bringing home nearly double the amount of supplies it brought up, about 2,668 pounds (1,210 kilograms)," NASA officials said in a statement. "Returning investigation samples will demonstrate how life in microgravity affects the growth of plant seedlings, changes to the human body, the behavior of semiconductors and detergents, and more." Some of the experiments will only stay on board for three weeks, making a round trip back to Earth with Dragon when the capsule detaches from the station. One of those experiments involves thale cress, a plant used in many experiments because of its small, relatively easy-to-map genome. "The experiment will study how plants adapt to micro- and low-gravity environments," NASA officials wrote in a statement. "Researchers hope to determine the ability of vegetation to provide a complete, sustainable, dependable and economical means for human life-support in space." 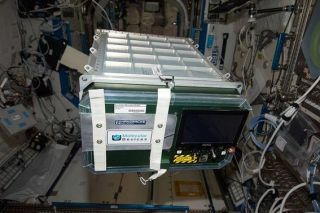 The Experiment Container with Plant Seedling Seed Cassettes (seedlings, inset lower right) is an example of the samples returning aboard the SpaceX Dragon vehicle for ground analysis. Beyond helping scientists learn how to grow food in space, the research might contribute to better agricultural practices back on Earth. Understanding how these plants react to a stressful environment could lend insight into how farmers could mitigate those taxing situations back on the planet's surface. Some of the experiments sent to the International Space Station will play a role in education, as well. "Students from several California schools developed investigations to study bacteria, iron corrosion, battery performance and carbon dioxide levels aboard the station, all of which will be delivered by Dragon," NASA officials wrote in a statement. Personal product manufacturer Procter & Gamble sent up another experiment that will study how to better preserve toothpaste, gels and creams. "Particle additives can make a product last longer by maintaining its consistency, but they sink and clump together after a certain amount of time, which can spoil a product," NASA officials said. "It's difficult to study these dynamics on Earth because gravity gets in the way, making the space station an ideal research platform for these important industrial processes." Although Dragon's launch went flawlessly, once the capsule parted from the Falcon 9 rocket used to boost it into orbit, one glitch became apparent. A thruster problem delayed Dragon's approach to the space station by a day. The spacecraft is expected to return to Earth with experiment results and other gear on March 25. Dragon also brought a few treats for the astronauts, with bananas and apples among the first items unloaded to the space station. Follow Miriam Kramer @mirikramer and Google+. Follow us @Spacedotcom, Facebook or Google+. This article was first published on SPACE.com.